Any scientific analysis is only as accurate as the least accurate input. Gross errors in structure orientation, solar system sizing, collector placement, component specification, and scientific studies can result when designers/engineers fail to accurately assess shading patterns at proposed building/ecological sites. By combining the site-specific shading data of the Solar Pathfinder™ with the published global weather data, an accurate solar site analysis can be made. This insolation data, on an hourly and monthly basis can then be applied to architectural, engineering, solar, and ecological applications. All of this data is integrated in the Solar Pathfinder Assistant software, sold separately. The Solar Pathfinder™ uses a highly polished, transparent, convex plastic dome to give a panoramic view of the entire site. All the trees, buildings or other obstacles to the sun are plainly visible as reflections on the surface of the dome. The sunpath diagram can be seen through the transparent dome at the same time. 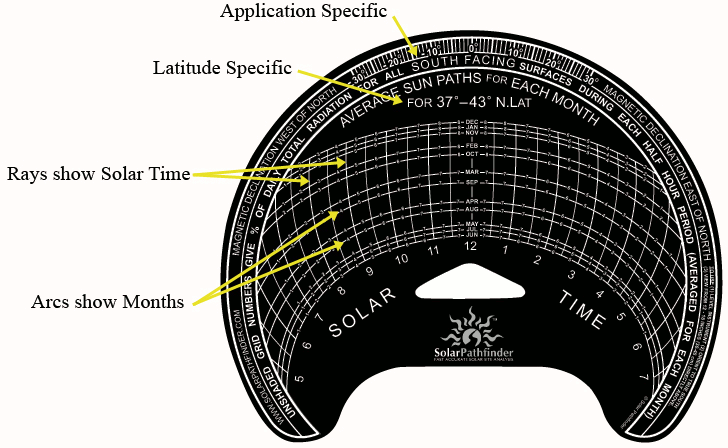 Because the Solar Pathfinder™ works on a reflective principle rather than actually showing shadows, it can be used anytime of the day, anytime of the year, in either cloudy or clear weather. The actual position of the sun at the time of the solar site analysis is irrelevant. In fact, the unit is easier to use in the absence of direct sunlight. It could even be used on a moonlit night. The diagrams are application specific: "South-facing" (for Northern hemisphere) or "vertical" is for applications of 20-90 degrees tilt — usually solar; "Horizontal" is for applications of 0-20 degrees tilt — usually ecological. The diagrams are latitude specific (the closer to the equator, the more the sun's monthly paths will be overhead). The rays depict solar time. The arcs depict average sun path for given month. The small numbers given in half-hour increments give percentage of radiation for that half-hour. For the flexibility of calculating radiation of any azimuth and any tilt angle, use our Solar Pathfinder Assistant software in addition to the Solar Pathfinder. 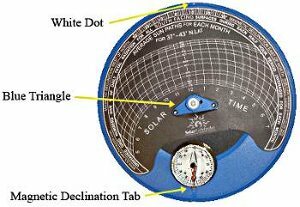 Pull out magnetic declination tab to adjust for magnetic declination. Rotate diagram (use blue triangle) to make magnetic declination adjustment. Line white dot up with proper declination value (negative numbers are left of the "0"; positive numbers are right of the "0"). Push in magnetic declination tab to relock. Place base section where you want to make your site analysis, making it relatively level (the instrument section will "fine-tune" the leveling). If you are installing PV or thermal collectors, the unit needs to be approximately the same height and placement the panels/collectors will be. NOTE: The telescoping legs of the tripod can be adjusted for leveling. Alternately, a bean bag can be used to help in leveling and to secure the unit from sliding off a pitched roof. If using optional tripod, insert a ball-tip from a tripod leg into each of the grommets on the base section. Set instrument section on base section. Adjust bubble level so that bubble is in center of black circle (instrument section can rock/adjust on base section to do this). Adjust unit so red arm of compass points north (for northern hemisphere). Place dome section on instrument section. 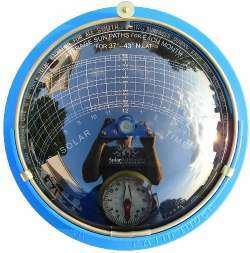 The Solar PathfinderTM is designed to be viewed from between 12-18 inches above the dome (if taking a digital photo, the camera should be between 12-18 inches above the dome) and directly above the vertical centerline on the sunpath diagram. Site readings are best taken on cloudy or overcast days to avoid glare from the sun. On a sunny day, block the sun's image with your free hand. CAUTION: DO NOT STARE AT THE REFLECTED IMAGE OF THE SUN ON THE PATHFINDER™ DOME. When viewing the Pathfinder, you are looking for two things at the same time. First a reflective, panoramic view of the site will be seen on the dome. Simultaneously, the sunpath diagram will be seen through the dome. Where the reflected objects on the dome intersect the sunpaths shown through the dome, the site will be shaded at the time indicated on the diagram. The sun will not shine on this site until approximately 9:30am during the month of December. It will be shaded again in the afternoon from about 2:15pm to 3:45pm. In February, the sun will shine on the site from 9:15am throughout the rest of the day. 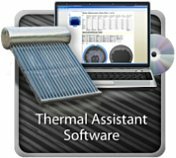 The manual gives detailed instructions on how to manually calculate the radiation information, however, we highly recommend using our Assistant software (sold separately) for fast, accurate, professional-looking reports. This Feedback Forum is for you to share comments or suggestions to help Solar Pathfinder continuously improve the Solar Pathfinder to meet the needs of our customers and the industry. By using the Pathfinder this afternoon I see I have 2 good sites in my backyard for a greenhouse, and I also see I could add a workable sunroom to my house. I feel that the Pathfinder paid for itself already. If my backyard turned out to have too little winter light, then I would have taken the Pathfinder and my camera with me when I went house hunting! "Must have" piece of gear for solar installers! 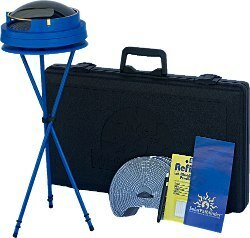 The Solar Pathfinder is a must have piece of gear for every installer's tool kit! Unsurpassed for the professional analysis of solar characteristics at any proposed site and for a graphic display to clients. 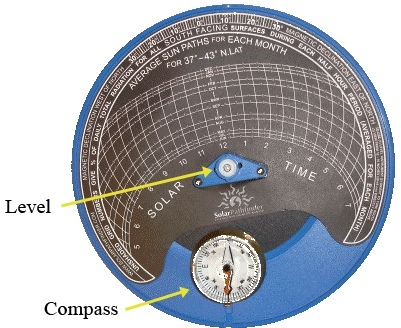 We have found the Solar Pathfinder to be a simple, straight forward tool for training certified solar site assessors. The Solar Pathfinder provides all the answers for the people in the field and the home owner. by Ron Thornton -- Physics Dept., Tufts Univ. Clever engineering for functional low cost! As an emergency communicator and a volunteer first responder specializing in disaster recovery communications, I would not be without a Solar Pathfinder. This is the only tool that can produce fast and accurate siting information for solar powered emergency equipment. During Katrina and Rita, there were adequate engine powered generators to meet need but fuel was inadequate causing most of these generators to be idled due to lack of fuel. One of the lessons learned from these events is the importance of using solar and wind to augment and stretch scarce emergency fuel reserves. The Solar Pathfinder makes it possible to site solar assets quickly and provides an accurate means of predicting solar power availability. I would not consider an emergency managers inventory complete that does not have access to a Solar Pathfinder. The Solar Pathfinder is part of my deployment kit for the EMCOM/EMPOWER Trailer my wife and I designed and built to support our volunteer activities. DISCLAIMER: This endorsement is my personal endorsement of the Solar Pathfinder and does not constitute an endorsement of the product by Nortel, the City of Garland, the Garland City Council, North Central Texas Council of Governments, the Garland Radio Amateur Civil Emergency Service, or the ARRL Amateur Radio Emergency Service. Calculating tree height for wind apps. i pulled out my SP at a recent MREA wind site assessor workshop and created a buzz when i used it for calculating tree height for wind applications. After overlaying the angle estimator onto the sun map and comparing data to the PVWATTS tool, it looks to me that ideal array tilt is about 5-10 degrees less than the angle at solar noon for each month. I guess that makes sense as I've read ideal azimuth is within 10 degrees of solar noon. So aligning panels within 10 degrees below solar noon at 180 deg azimulth means the panels may be in a better position as the sun's angle decends from solar noon. As a startup business trying to fund my own expenses this is truly the choice for value. 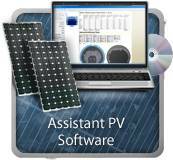 Thank you for providing the tried and true, dependable, and accurate solar shade analysis tool! Once again, I used my trusty Pathfinder. This time, I needed to find a place for my bee hives. Being in a warmer climate, I wanted them to have noon and early afternoon shade. I wanted them to spend their time making honey, not trying to keep their hive cool! Thanks for such a great instrument! I was the vender (Brown Consulting) that made friends with you at the kempton festival. I just found another use for the pathfinder. I was hired to locate a positon for a light tube on top of a house. The owners wanted to know where to put the light tube and how high to put it. I gave them the spot and we ended up installing it 4 ft. above the house for best results. Just thought you might want to know. I remember you asking me what I used it for. I have now used it for windows, Direct TV, overhangs, PV, house placement, garden placement and now light tubes. Thanks for a great product American built, designed. Yes, we are proud to be 100% American made of American components !!! Thanks for your help in achieving an "on time" delivery. I think I opened the link at 1:00 p.m yesterday and I was sitting in the communication director's office with printed reports in hand by 3:00 p.m. He took my proposal to the ORNL Laboratory Director before COB yesterday and I should have a response today. I just got my Solar Pathfinder, awesome! I have talked to you in the past but I'm planning on using the Pathfinder for garden placement and other shade related issues. Let me know if there are other products that you offer that would help me out. This company has some outstanding customer service. 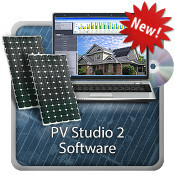 I would recommend solar path finder software to everyone in the in the solar site assessment business. This product makes the site assessor job so much easier, and very professional looking. Thank-you for making site assessing easier, solar pathfinder is so very important to a successful site assessment. We purchased a couple of Solar Pathfinders from you a few years ago. I can’t say enough about them. •	Rental income. One of our pathfinders has been ‘sold’ and rebated several times. We sell it to the client if they’re not close by then credit them for most of the cost of the unit when they return it and start purchasing from us. Please provide me with dealer pricing.